On Sunday Marty Lurie interviewed Joey Amalfitano a New York Giants bonus baby back in the 1950’s. The interview brought back a vivid memory of a frigid foggy night at The Stick back in 1963 when I was ten. Here’s the email I wrote to Marty Lurie in response to the interview and flashback. Loved your interview with Joey Amalfitano on Sunday. It brought back a very pleasant memory. My brother, father and I were at the game the night Joey hit his only career walk-off homerun! Joey only had nine homers in his career. I vividly remember it, even though it was 55 years ago in 1963, as it was the first walk-off homer I had ever seen in person. It was a game that my father’s company, American Airlines, had group tickets for. They usually got four or five games a year for the company group, usually on a Friday night. My father usually took advantage of the discounted group price and took my brother and I to those games, once a season our grandfathers would also come. The Giants were playing the Mets that Friday night. We usually had decent seats down the third baseline far back in the first deck at Candlestick. That was the best location to be to be sheltered from the infamous Candlestick howling gales off of Candlestick Hill. We almost left in the bottom of the first when the fog and wind got so bad that the umpires called time. Even in our sheltered location it was one of the coldest nights I remember at The Stick! My dad wanted to leave when the delay stretched for a long time. Of course, me and my younger brother begged him to let us stay. I don’t remember how long the game was delayed, it seemed forever with my dad itching to go. But, I definitely remember what happened when the game resumed! The two Willies, Hall of Famers Mays and McCovey, hit back-to-back bombs! It was unfair to the poor Mets starter to have to stop then start again on such a frigid night. Now they’d have a relief pitcher resume the game. But, as you know well, things were different then! 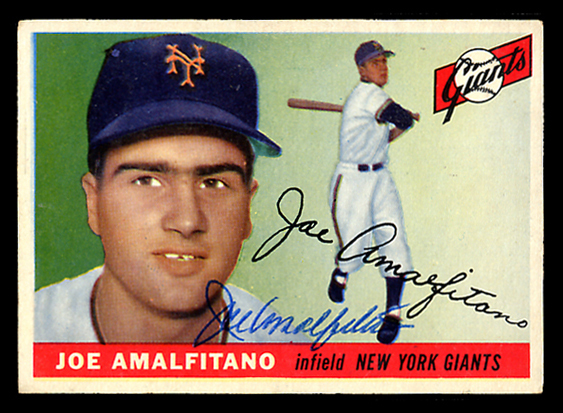 Joey Amalfitano was in the lineup due to an injury to the regular second baseman Chuck Hiller, who had thrilled me by hitting the first NL grand slam in the World Series against the Yankees the previous fall. Joey was hitting about ,150 at the time. The wind and fog subsided as the game worn on. When the Mets tied the game up In the late innings our dad began hinting we’d be leaving soon whether the game was over or not. Back then the night games started at 8 PM at The Stick. With the lengthy delay in the first inning because of the fog it was now past 11 PM. Our howls of protest about it being a Friday night with no school the next day fell on our father’s deaf ears. Luckily when my brother and I continued whining about leaving before the game was finished, one of my dad’s colleagues from work loudly proclaimed that he and his son never ever left a game early! Whether his colleague’s taunt or my brother and my howls of protest goaded dad to change his mind I will never know. But we stayed as the clock struck midnight! I don’t recall what inning Joey hit his walk-off homer in. But, boy, do I remember the reaction by the Mets to the homer! The Mets went ballistic in protest that the ball was foul! I remember Duke Snider, who was in leftfield, racing in to rip the third base umpire for his blindness. The Ol’ Professor, Casey Stengel sauntered out as fast as his 72 year-old legs could carry him to join the crowd of Mets jawing with the umpire as the remaining hardy loyal fans howled with euphoria. I looked up the game to fill in the gaps in my memory. Now, here’s the rest of the story compliments of the excellent website baseball reference and the Oakland Tribune from May 18, 1963. The date of the game was May 17, 1963. Amalfitano’s walk-off came with one out in the bottom of the 11th. The unfortunate pitcher that served up Joey’s walk-off was none other than future Giants manager Roger Craig, the “Humm Baby” himself! Craig plunked Willie Mays in the arm immediately on entering the game in the 10th inning. The winning pitcher, picking up his fourth career victory, was another Giants Hall of Famer Gaylord Perry. Duke Snider was in leftfield as I remembered and bumped the umpire, Frank Walsh, in his heated disagreement. And, Marty and Bruce Jenkins will love this … the Mets third base coach who argued so hard was Solly Hemus, the frequent inside joke of Marty and Bruce on the weekend!! ← Two Crazy Women Take Me to Spring Training! Thanks Billy! It was my first walk-off I saw in person!